I am so happy to hear that you are finally on the mend, being sick is no fun! Your cards are absolutely gorgeous! I love the pretty background and color combination! Have a fabulous day! This is so pretty and feminine Sherrie, I love everything about it. I am so glad you are feeling better, It is no fun being sick once, but 2x is really sad. Stay healthy now!! I'm so glad you're feeling better Sherrie... How awful to have it linger for 10+ days... Ugh.. Your cards are Gorgeous! 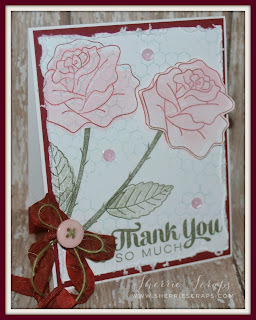 I LOVE the design and beautiful flower... wonderful use of JB Products!!! Continue to get better sweet friend! HUGS! Oh wow, Sherrie, these are stunning!! The roses look amazing!! You colored them perfectly!! I love the background and the beautiful ribbon!! These are so elegant and gorgeous!! I absolutely love them!! Thank you so much for playing along at DL.ART!! So glad you are feeling better! 10 days would be such a long time to be sick!! And your card is soooooo beautiful!! Those roses are really fabulous! Thanks for playing with Jo's Scrap Shack. I hope you feel 100% soon!! I love love love these!! The colors are beautiful and loving the flowers!!!!!!!!!!!!! Glad to hear that you are feeling better. Your cards are beautiful & stunning. I love the pretty flowers and bow!Awesome background too! Oh no! I'm so sorry to hear that you have been sick. I had one of those colds that lasted for 3 weeks and I know how miserable it can be. I'm happy to hear that you are feeling better! These cards are absolutely lovely. The flowers are so soft and pretty and the ribbon is such a lovely finishing touch. Such pretty cards Sherrie! Those roses look fabulous! Super cute cards 🙂 Thank you for playing along with us at Jo’s Scrap Shack. 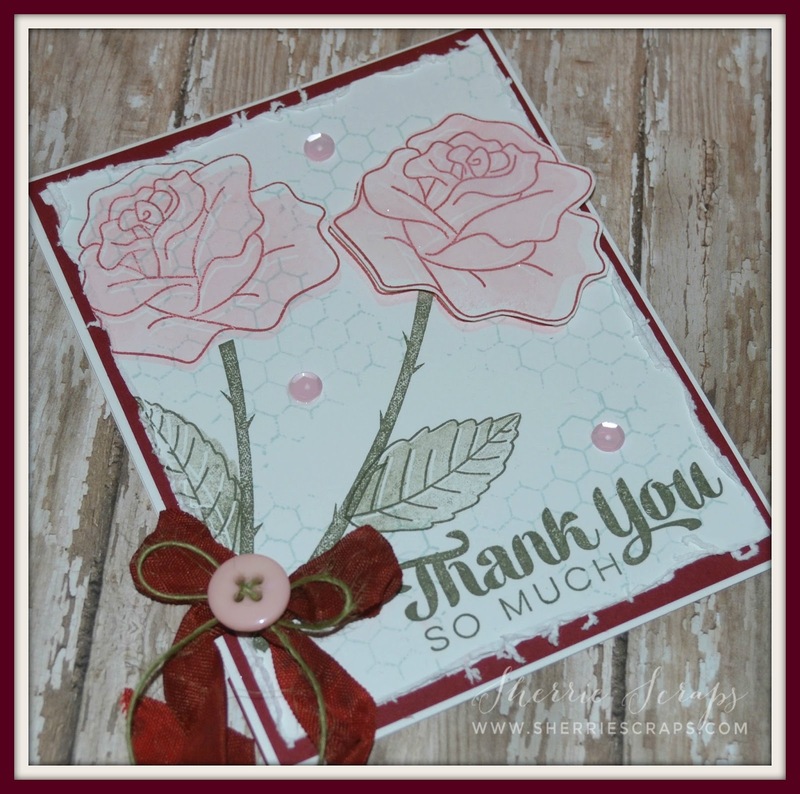 Beautiful cards, Sherrie! 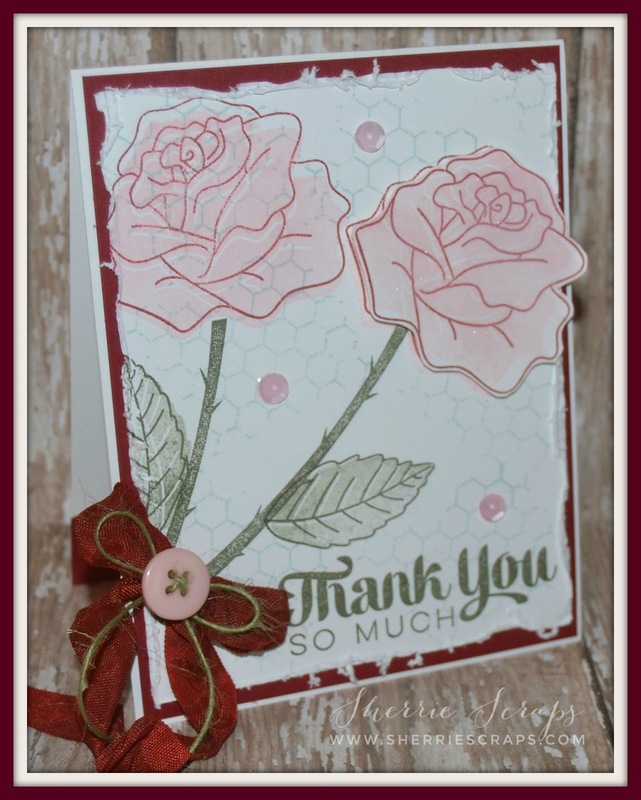 Love those flowers and I love your distressed background with the chicken wire stamping and the frayed edges. Adds such a sweet vintage touch to the design, along with those fabulous bows! So glad you hear you are finally feeling better! Yay! 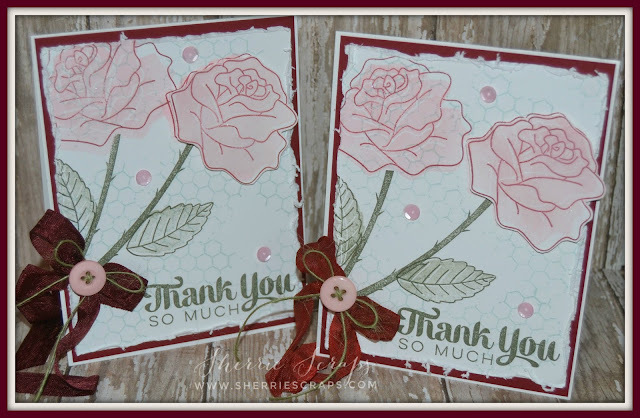 These cards are BEAUTIFUl, Sherrie!!! Love the pretty flowers and the background!!! Have a great weekend. Wow Sherrie these are gorgeous!!! Gorgeous roses!!! I love the background and love that gorgeous sentiment! Thanks for linking up with us in our FFC this week! Hope you have a great weekend hon! So sorry to hear that you have had the flu . I hope that you are on the road to recovery my friend. Your card is lovely. Your cards are gorgeous! The flowers are beautiful and the crinkle ribbon bows are lovely with the button and jute! Wow! These are so pretty! Love the background too!! Oh no, I'm so sorry to hear you've been sick, but so glad you're feeling better. Yikes, that flu was terrible this year!